Beardy’s & Okemasis First Nation, Treaty 6 – In a historic first in Saskatchewan – and only a second in Canada – the Beardy’s & Okemasis First Nation will celebrate and honour Two-Spirits – Indigenous individuals identifying as either Gay, Lesbian, Bi-Sexual, Transgender, Queer, or Questioning – in an inaugural Two-Spirit Pride Festival on June 9th, 2016 on the First Nation located 45 minutes north of Saskatoon. “More and more youth are identifying as Two-Spirit in our community, we want to acknowledge you and let you know you’re not alone” added Chief Rick Gamble. The pride festival will kick-off with a parade through the community to the Band Office followed by a ceremonial Flag raising and BBQ over lunch. Individuals and groups who wish to join in the festivities are encouraged to do so. 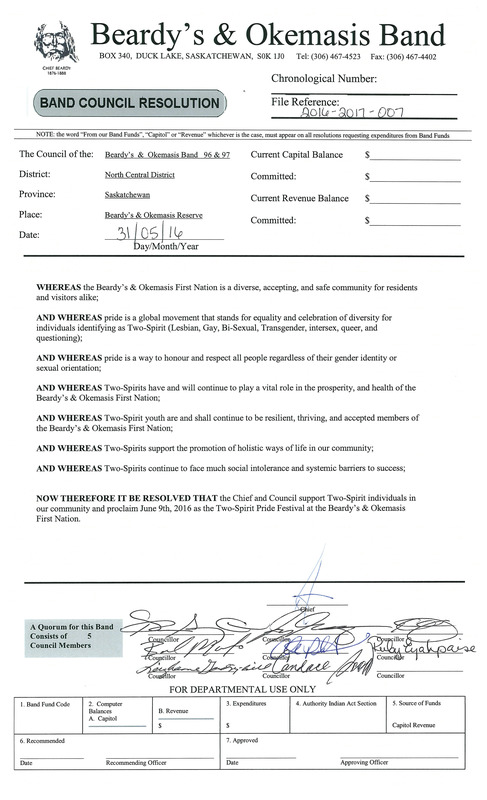 You can view the full proclamation here, register for the festival on the event website, and find more information on the Facebook page. “We invite everyone in our community to join us and come together to proudly proclaim that we celebrate and welcome diversity – it all it’s forms” concluded Seesequasis.